When it comes time to write the book itself I’ll shut the lights out, picture the scene I’m about to write then close my eyes and go at it. Yes, I can touch type. Trying to write books with a subject matter or in a genre or style you’re not familiar with is the best way to find the Big Block looming. Rule one: Write about settings you’re familiar with. My books are primarily plot driven but the best plot in the world is useless if you don’t populate them with characters that readers can care about. It means working harder to do the research but I don’t really mind – I don’t think I have what it takes to chase criminals through back alleys and wade through blood at crime scenes. If you have a craftsman’s command of the language and basic writing techniques you’ll be able to write – as long as you know what you want to say. 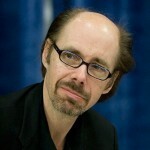 Jeffery Deaver was born in Glen Ellyn, Illinois, USA. He is an American crime writer. He earned a BA degree in journalism from the University of Missouri and a law degree from Fordham University and originally started working as a journalist. He has written several novels include: Manhattan Is My Beat, Death of a Blue Movie Star, The Bone Collector (Won- Nero Award), The Coffin Dancer, The Devil's Teardrop, The Empty Chair, Hell's Kitchen, The Stone Monkey, The Vanished Man, Garden of Beasts (Won- CWA Ian Fleming Steel Dagger award), The Twelfth Card, The Cold Moon, The Broken Window, The Burning Wire, and Carte Blanche. He has written several short stories include: Twisted, and More Twisted.